As ukulele players, most of our time is spent playing chords and making sure to hit the right chord change at the appropriate moment. Most of us start out by learning our favorite songs and strumming along merrily. At one point though, it is important to delve into some light theory to understand the inner workings of chord progressions to reach the next level and really enhance your playing. Once you see these progressions as little formulas and understand where they come from, learning and memorizing songs become a real breeze. You will eventually save time and recall music in a more efficient manner. never changes and it is the foundation of many musical theory concepts. Once you’ve learned the Roman numeral system and you are comfortable with it, it’ll be simpler to identify a song’s key and analyze its chord progression. To do so, write down all the chords that are present in the piece. Usually, a good place to start is when you notice two consecutive major chords (for example Bb and C) to figure out which key the song is in. In that case, it would be F, because that’s the only scale that has both the Bb and C major chords. If you’re having a hard time figuring it out, put all the chords in ascending order of their root notes and see if you can figure it out that way. Try it out with songs you already know and understand how it works for yourself. Once you know the key, it’s easy to apply Roman numerals to each chord and see the chord progression as a series of Roman numerals. Most chord progressions will run for 4 bars, but this can vary and things will look different depending on the time signature and general arrangement of the song. The more songs you learn, the more patterns you will see in the progressions composers use to write music. There are definitely go-to chord movements and reoccurring orders in which chords are played. 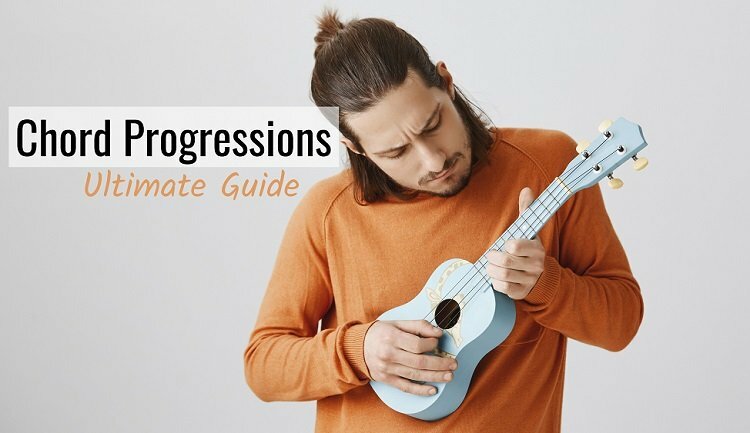 Here are some of the most used progressions. I suggest you practice these in all the keys you can think of, it will definitely help you to absorb and understand the concept. Where things get really interesting is when you apply this knowledge to the ukulele fretboard. By purposefully using barre chords and omitting the open chords of the uke, you will translate the chordal changes to physical movements. Muscle memory is quite important in music and will help you save time and develop finesse and efficiency. By learning a few of the major and minor barre chords, you’ll be able to play most chord progressions in one area of the neck using the same chords over and over again. Start with these two chords and practice all the I, IV, V chords you can in every scale. You can start with the root of the scale based on the 4th string, but also make sure you practice with the root being on the 3rd string chord and see the difference between the two. Now with the addition of this minor chord whose root is based on the 2nd string, you can play all the progressions included in this article. As you can see, no matter the key, your fingers are always doing the same thing, it’s simply the area where you play that changes. Although all this may seem like a lot of work, the idea behind is that the more you recognize the musical patterns that exist, the faster you will be able to memorize songs and their progressions. Another awesome side effect of seeing things in Roman numerals is that you will be able to transpose any song without actually thinking about adjusting each and every single chord of the piece. You’ll just translate it into the numeral system and apply the correct chord in the new key you want. If you spent time working on translating the progression to barre chords, it will be a simple task of starting in the right key and let your fingers do all the work with minimal thought!